Hmm, vegetablegarden.info actually lists seeds by Zone (10b=us) instead of vague zone (Goldenrod) like the other plant guide (that I like but may not be specific enough). WHOLE different planting schedule. This one says everything I planted was put down too early for 10b. My Turnips seem to be doing fine, but might explain why everything else gave up. Does mean I should be able to sow the seeds I already have & try them again. (Pfft says Cauli shouldn't be seeded til Oct!! /fingers crossed.. I want to try to eat some Turnip leaves. They're fighting hard because they're all so bushy. Bet they'd do just fine one-leaf-less each. Since my original schedule says my turnips should be done next Wedesday I'll pull one up to see how big it is. I can always put it back, probably. Rosemary Turkey Salisbury steaks in Jalapeño Jack sauce, topped with broiled tomato and mushroom. Side: Half a baked Delicata Squash. Also: Discovered there were only 11 A's on that Soc exam, Highest Grade was a 96%, there were only two of them. /toots own horn. 120 students enrolled, 11 A's, 40 B's, 35 C's, 21 D's, 8 F's. Booo, so a friend let me know that Ty had plushies out for Ga'Hoole. I didn't know they'd released them before the movie! They were 3.50 before the release, and have of course doubled since. *Soren and Eglantine are both Barn Owls (one light, one dark), and I wouldn't mind a few more of those! *Gylfie is an Elf owl, though he looks more like a Burrowing, and I actually HAVE a Burrowing that looks just like him. *Digger is a Burrowing, but he looks like an Elf owl!! I wouldn't mind him, I don't have any Elf owls. (I wonder if the page just got their descriptions confused, won't know til I see the movie. Left to right: Soren, Eglantine, Gylfie, Digger. The webbie with their images and descriptions: HubPages, Ga'Hoole plushies. Could an IUD be construed as Abortion? A question for the Sons of Abraham (excluding Catholics and other sects where birth-control is a sin): An Intra-Uterine Device prevents pregnancy (primarily) by disrupting the uterine environment chemically and (secondarily *sp) by disrupting the uterine lining to prevent implantation by a fertilized egg. If life begins at conception, which occurs in the Fallopian Tubes, and an IUD (having failed to prevent it chemically) successfully disrupts the uterine lining and causes the fertilized egg (life) to be shed from the woman...Is use of an IUD possibly purposefull abortion, and thus murder?Pardon spelling errors, TreoMail has no spellcheck. So, I've come to the conclusion that my seedlings are a loss. This means I will have no broccoli this time around, as the time to translate a healthy plant has passed now. Bear in mind that the sparseness you see Left is after TWO WEEKS. Pft, almost three. ~The Chives pot grew nothing, not even the little round leafed invader sprouts. ~The two broccoli pots have the invader weeds, and to brought my hopes up a little reddish-stalked sprout. 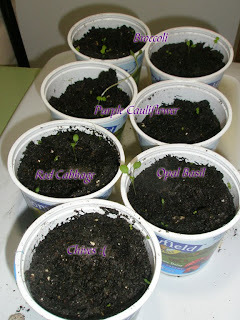 ~The red cabbage pot had a strong looking seedling, but green..
~The two purple cauliflower pots had seedlings, but they looked just like all the others! Until three days ago when something sprouted up SO FAST and grew SO TALL that it fell over! Every two hours I noticed it have MOVED again! I was sure it must have been some green version of mushroom to grow that fast. ~The opal basil pot was my only hope, having a green spout with two "true leaves" beneath it that are kind of jagged. So with my husband at drill this weekend I was disposed to venture to an SCA potluck on my own. I used to be very able to go places on my own, having been known to take a Scottish tram into the middle of Glasgow to see church's on my own when no one else was interested in going. In the last few years I've been anxious to even drive myself alone to the store! I spent an hour, dress in my fencing garb, sitting at the computer recompiling the persona I want to register (putting away Julianna Wilkins, the Pirate Captain, in favor of Katryn Weir: a late 16th Century saucy Scots-Irish). Finally, after txting my husband that I might not go at all, I put up Rook and ventured out sans Rapier Gear or Food for feast (I had not had time to go shopping). Ah, to Wait, and Hope. How sweet it is, when I finish a novel I loved, to sit and let the feeling of it carry me a way for a few moments after turning the final page. What an amazing book. It is the kind of story that clings to you, and you can tell that your mind may be changed forever. It was hard not to over-notice the Shakespearean 'Romeo and Juliet' thread, which (though pervading all cultures in history) was probably not so overused in popular novels at the time of its penning as it is now, thanks to popular media. Very interesting was how it started with the perception that Edmond and Mercedes were the Star-Crossed-Lovers. Equally interesting was how I came to almost loathe Mercedes: I have a hard time with masochistic piety. I originally misaligned the hearts of the two (to me) important women, but with the Herreras effectively written out came to adore the end result. 12 hrs in a running car w/o A.C, in FL. Cramping on a Monday? No fair.. The first day of cramping, always your Monday, is the day that:*You'll oversleep. *Pull your workshirt out of the dryer with more hair on it than when it went in, but with two missing buttons. *You leave the house late. *The guy in the souped-up piece-of crap stalls at the light. *The day the old lady, who has to look out the side window cause she can't see over the dash, goes 25 in front of you over the bridge. *Among other ridiculously irritating little things.I dunno what I did to piss God off... But I'm really sorry. 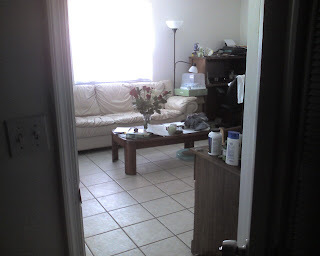 So, while for some reason I cannot get the Blogger or Picasa to play nice, and thus this post looks like garbage, the garden itself BLEW UP in the last four days! LOOK how BUSHY they got! 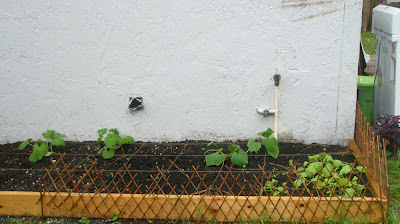 The turnips are almost a shrub in comparison, and the cucumber got so tall it finally fell over and shot out tendrils! I reaaaally need to device a trellis of some sort, and soon. The Bamboo and netting idea got shot down when I learned I cannot attach anything to the siding of the house. The stucco is concrete or something. In case you guys don't remember the Corpsman bustin moves to Ferglilicious (one of my favorite YouTube finds of all time) Click below for a review. Now, in the same spirit comes another fantastic find: soldiers deployed to Afghan-land with a whole music video to Lady Gaga's "Telephone". Dude with the reflector belt dress gets many points. Omg, I hope none of them ever want to advance very far, though I think they should get promotion points for extreme creativity. Now if you excuse me, I need to go watch my Corpsman shake his Fergie-Thing again. My husband just wrote about the obsolescence of the Quinceanera. In it's CURRENT incarnation I agree; however, I agree with its foundation: graduating a from girl to woman. We have our own "Western" way of it now, High School Graduation, even some Sweet Sixteens. This Sioux Coming-of-Age Ceremony represents what that graduation should be, and used to be. I may be biased: watching an informal ceremony where a Duke's son was pronounced a man by his father, around a Mixed Weapons fire, by the giving of a dagger and a repeating of the deeds that proved that boy a man... It struck me. Being a Man, or Woman, should carry responsibility, be a proven title, not just an age limit. Is it shameful to go Dumpster Diving after watching a kid get evicted from an $80,000 condo? My New-in-box Cedar & Crystal chess set says no.I also scored a New In Box 6-Bottle Liquer pourer (should resell nicely) and 2 decorative short Samurai swords.Win. So, it had been a while since I got to post pics of the little garden. A great many didn't grow: broccoli, chives, Basil. I'm going to try to start them inside, though it's supposedly too late for the Broccoli. The Winter Squash got tall, but there's some yellowing lower leaves. The Thinning of the Turnips and Beets (After Rook trampled a bit) took alright, until she trampled through it again. Now it looks like I may get 4-5 beets and a ton of turnips. I put up this spiky willow thing to try to keep her out, so far so good!